Vigilant was founded in 1960 by a group of companies seeking to create a community where they could access shared resources among labor relations professionals, HR specialists, and safety consultants. Today, they are advisors on complex employment-related issues for manufacturing companies on the west coast. 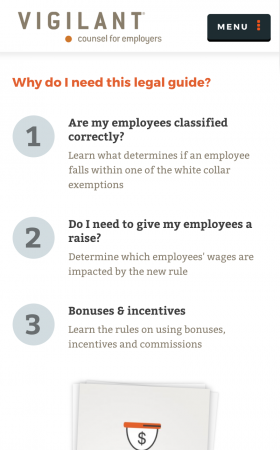 They offer a suite of services to employers focused on employment law, learning and development, safety and HR best practices. Adpearance has been performing digital marketing services for Vigilant since 2012. In 2016, Vigilant sought to enhance its current digital presence by launching a modern, responsive website. Primary project goals included streamlining content to better promote business offerings, building a robust and clear CMS to allow for frequent and seamless updates, and updating site design and layout to reach and convert more users. Vigilant’s new site was the first website Adpearance built on EE3, released in late 2015. It was a substantial platform update, giving CMS users a cleaner interface and more ways to update the functionality and content of their website. Vigilant’s digital presence now includes a responsive website optimized for conversion, user experience, and SEO in addition to their targeted LinkedIn advertising campaigns and regular blog and downloadable content production. Vigilant's new website re-invigorated the 50 year-old brand. We replaced their muted, pastel colors with a bright, energetic, and modern palette. The abstract photography was removed and new line illustrations created to give the brand a much-needed visual overhaul. Wanting to differentiate themselves from their competition and build personal relationships with their clients, Vigilant invested in new photography for their employees. Adpearance assisted with art direction and weaved in new group photos throughout the site to put a face to the truly exceptional services Vigilant offers. The homepage was designed to better show who Vigilant is and the services they provide. With the website redesign, we also updated Vigilant's branding to incorporate the orange dot from their logo throughout the site. 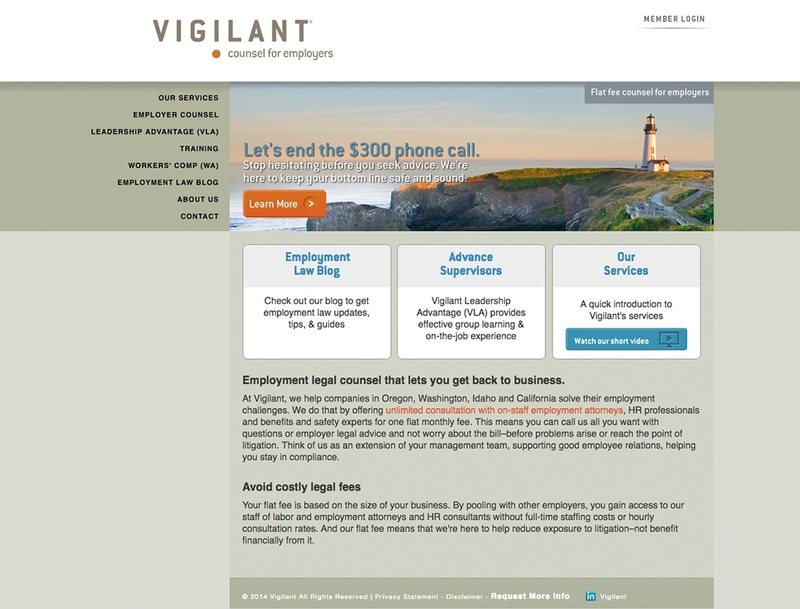 This page contains a wealth of information about Vigilant's primary business offering, their employment law advice. We redesigned the page to highlight their most important content in a readable format. The Vigilant team is constantly creating new blog content. 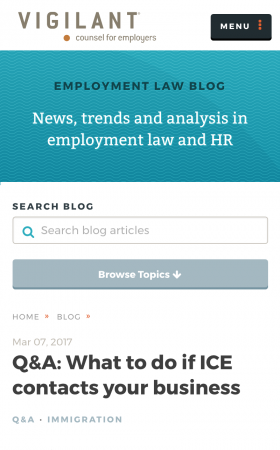 Users can now access this content on their mobile devices in a quick and easy way. 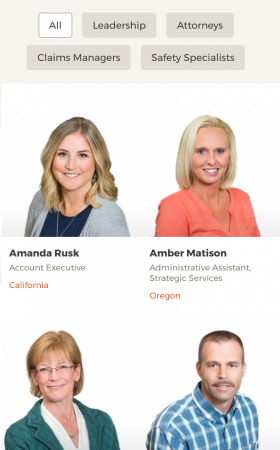 A popular page on their site, Vigilant's new About Us page features large, colorful photos of their staff, all filterable by team for ease of use. 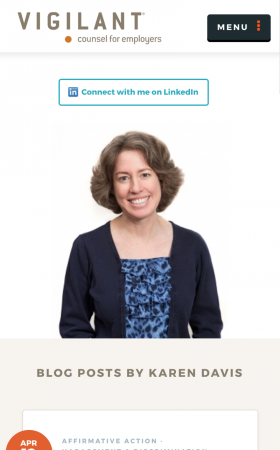 Individual staff pages include a personable bio, large portrait, recent blog posts, and LinkedIn integration. 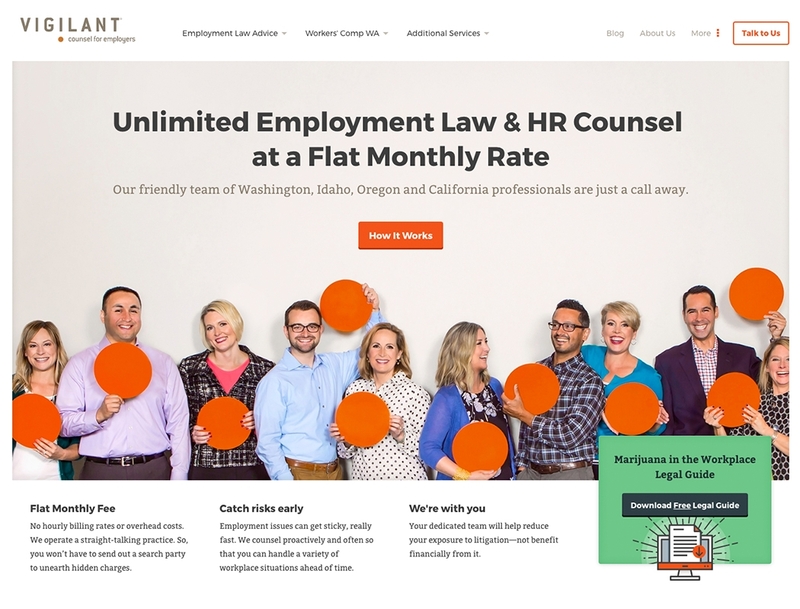 Lead capture was improved through the redesign of landing pages for Vigilant's free downloadable legal guides and model policies. Like what we did for Vigilant?